The Donut Hole (and two other small ones to the south) at the center of the Arctic Ocean. On June 4, I wrote about issues surrounding the continental shelf in the Arctic Ocean. June 5 was National Donut Day. So that makes it a better time than ever to talk about the so-called donut hole in the Arctic Ocean. There also is some misinformation on the donut hole out there that requires clarification. The Pew Charitable Trust’s website, while otherwise very informative, says that the donut hole is a mere 2.8 square kilometers, while Business Insider notes that the donut hole consists of “open water.” In fact, the National Snow and Ice Data Center notes that the North Pole, which lies within the donut hole, likely hasn’t been ice-free in 125,000 years. The donut hole actually consists of some 1.1 million square miles of typically ice-covered water. The area’s name derives from its shape, which looks like an oddly squished donut hole according to current exclusive economic zone boundaries, which are based on the 200 nautical mile limit. The donut hole currently consists of international waters – the high seas or global commons, in other words. The donut hole’s existence is what gives legitimacy to the statements of officials from countries like China, most notoriously, who have said in the past that “The Arctic belongs to all the people around the world as no nation has sovereignty over it.” The donut hole also opens the door for non-profit environmental organizations to call for the establishment of an Arctic marine park or preserve. Oil drilling will likely not come to the donut hole anytime soon for two reasons. First, without territorial claims settled and legal regimes in place, oil corporations will shy away from this no-man’s land. Second, it is hundreds of miles away from the nearest landfall, making logistics exceedingly difficult. As it stands now, the donut hole also mostly overlaps with the deeper part of the Arctic Ocean rather than the continental shelf, meaning that drilling would have be both Arctic and deepwater. Yet the Arctic Ocean is changing swiftly, with the ice cap shrinking in extent at least since satellite monitoring began in 1979. Researchers such as Scott Stephenson, a professor at the University of Connecticut, have predicted that the Arctic Ocean could be ice-free and navigable by mid-century. This literal sea change could usher in new shipping routes and open new fisheries to exploitation – especially if certain species of fish migrate north in search of colder waters, as they have already been doing. While it is unclear if shipping companies will actually take advantage of northern shortcuts, if the ice melts, it’s almost certain that fishing boats will try to make their way up there. The owners of some of the trawlers that operate in the North Pacific Ocean, an already treacherous area, staff the boats with workers from developing nations like Burma and the Philippines who have little say when it comes to safety or workers’ rights. This practice is broadly known as “Illegal, Unreported, and Unregulated Fishing” (IUU), and can occur in both territorial and international waters. You can bet that if the ice melts, many shady industrial fishing companies will send their boats north with no qualms. Given the world’s increasing appetite for fish and the rapacious way in which companies vacuum them out of the ocean, one might think their bodies were covered in shimmering gold scales. In other “donut holes” of the world, like the area between Russian and American waters in the North Pacific or the area between Russian and Norwegian waters in the Barents Sea, IUU has already sparkes crises. Kevin Bailey, an employee of the Alaska Fisheries Center, wrote in an article published in a 2011 issue of Ecology and Society: “The little-known demise of the “Donut Hole” stock of pollock in the Aleutian Basin of the central Bering Sea during the 1980s is the most spectacular fishery collapse in North American history, dwarfing the famous crashes of the northern cod and Pacific sardine.” It took an international moratorium to ban fishing in the North Pacific donut hole, and it would likely require at a minimum international support to preemptively ban fishing in the Arctic Ocean’s donut hole. When it comes to this remote area of the Arctic Ocean, the five littoral countries surprisingly appear to have the foresight necessary to manage it properly. This is similar to the type of foresight that allowed for the creation of the Antarctic Treaty System in 1959 and the setting aside of that continent to science rather than militarization and natural resource exploitation – and the type of perspective that came too late in the North Pacific donut hole. To writ, on May 14, 2015, Russia and the United States were finally able to momentarily set aside their differences on Ukraine and sign an anti-IUU fishing agreement pertaining to the Arctic. Trapped crab in Alaska. Photo: Boris Kasimov/Flickr. A New York Times article from May 20, 2015 on the story is slightly misleading. First, while journalist Andrew Kramer claims that “the accord would regulate commercial harvests in an area far offshore — in the so-called doughnut hole of the Arctic Ocean, a Texas-size area of international water that includes the North Pole and is encircled by the exclusive economic zones of the coastal countries,” Undercurrent News reports that the agreement’s main aim is to stop illegal fishing of king crab in Russian waters. Second, the U.S. and Russia alone cannot regulate what will happen in international waters. Even the five Arctic states together can’t do that. 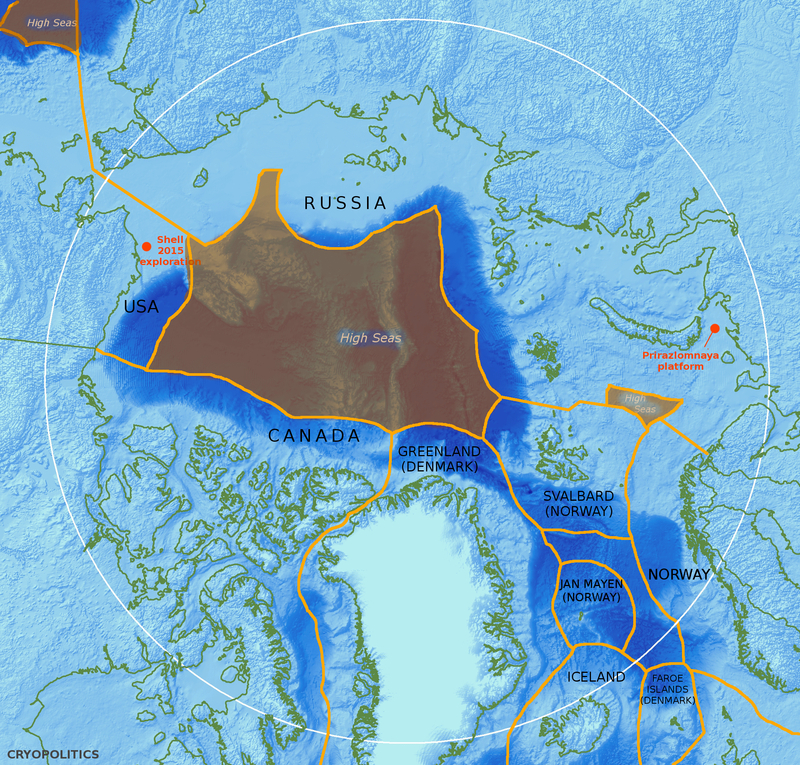 The only way they could regulate activities in the high seas of the donut hole would be to either a) garner support for an international moratorium* or b) somehow delimit the Arctic Ocean so that every square kilometer falls within a littoral state’s exclusive economic zone. If this were to happen, there would be no donut hole, and the Arctic Ocean would essentially be an enclosed or semi-enclosed sea (actually subject to a whole separate set of regulations under Articles 122 and 123 of UNCLOS) and no longer a “Polar Mediterranean” – at least not for fishing. For further reading, the K.G. Jebsen Centre for the Law of the Sea’s blog has a clear and detailed explanation of the history of attempting to regulate fishing in the Arctic Ocean. Gaining international support for regulating fishing in the Central Arctic Ocean may be easier to do than delimiting the continental shelves. The U.S. initiated a conversation about the status of the Arctic Ocean’s fisheries in 2007. Lots of progress has been made since then, as exemplified by a consensus reached at a meeting of the five Arctic coastal states in Nuuk, Greenland in 2014 on regulating fishing in the Central Arctic Ocean, along with Russia’s signing of the aforementioned agreement in May of this year. A few months prior in January, World Policy Institute reported that experts from the U.S., Canada, Russia, China, Iceland, Denmark, and Greenland convened at the Roundtable on Central Arctic Ocean Fisheries Issues at Shanghai’s Tongji University – again demonstrating the centrality of China in discussions about both the Arctic and fishing, since their country is the world’s biggest consumer of seafood. Whereas Chinese officials used to raise the ire of Arctic states when their officials claimed the Arctic Ocean to belong to all mankind, today, they tend to be a good deal more diplomatic, while officials from Arctic states increasingly find themselves coming to China to negotiate about issues at the top of the world. Kleinur, Icelandic donuts. Photo: Wikimedia commons. Now, it’s time to chew on all that and enjoy the best donuts the Arctic has to offer: kleinur, Icelandic donuts that are shaped like diamonds. I suppose that means the Arctic’s donut hole really only makes sense in an English-language context. Chinese donuts tend to be long and churro-like, meaning that the “donut hole” might not translate very well into Mandarin, either. *If you are in favor of an international moratorium, you can check out the Pew International Trust’s efforts to support one at this website. Reblogged this on EMerging Equity.